Welcome to my shrine for the Facts of Life! FOL Trivia: Click to View or Add Text. Welcome to Liz's Officially Unofficial Facts of Life Site. If you've visited this website before than you might have noticed that the name of the website has changed from Liz's Unofficial Facts of Life Site 2, to it's current name. Jo-isms: Click to View or Add Text. 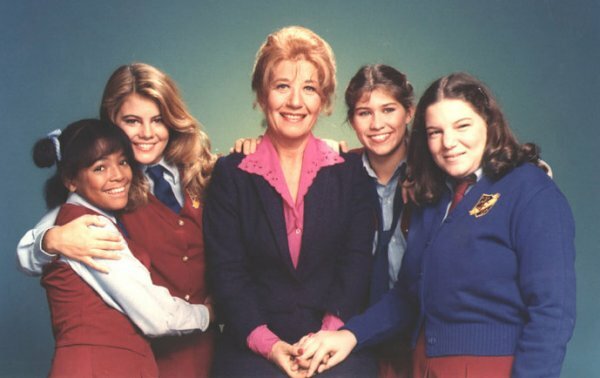 Pictured here is Tootie Ramsey (Kim Fields), Blair Warner (Lisa Whelchel), Mrs. Garrett (Charlotte Rae), Jo Polniaczeck (Nancy McKeon), Natalie (Mindy Cohn). Look! It's Blair and Tootie. Ok... maybe not. FOL Trivia:: Click to View or Add Text. Liz's Officially Unofficial Facts of Life Site~~~~Please tell a friend! !